If you're an event planner, the caterer you choose will be a key partner in any project. They may be independent operators or employees of a conference center, hotel, or restaurant. In either case, they handle all the logistics of food, beverage, decor, and entertainment, whether it's a cocktail hour or a formal sit-down dinner. By the time an event planner meets with a caterer, much of the preliminary work has been done. The event planner understands in detail the type of event planned, its purpose, and its guest list. It might be serious or celebratory. It could be a business meeting or a bring-the-kids company bash. The guests might expect cocktails or vegan health drinks, a sit-down dinner or finger food. As importantly, the planner knows the budget constraints. All of that and more goes into choosing a venue that has the right size, location, facilities, pricing, and food and beverage services. The planner and caterer then decide what they'll serve. An event planner needs to take into account the expectations of guests as well as the budget and should talk openly with the caterer about budget limitations. A good caterer can help create an event that looks elegant but isn't necessarily costly, with choices like using local seasonal produce. While the catering manager takes care of the food, service staff and facilities, the event planner needs to keep in touch while researching and implementing a plethora of related details. Transportation and on-site parking, the meeting agenda, audio-visual equipment needs, special menu requests, and last-minute changes all need to be ironed out before the event. The goal must be to avoid last-minute surprises on either side. 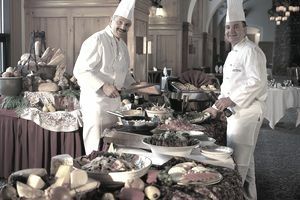 Menu substitutions, unexpected guests or drop-outs, and countless other snags can be taken care of before the big event. Back of House: Everything your guests do not and should not see; the equivalent of "backstage;"
F&B: Shorthand for food and beverage.